SOLDIERS PERIOD, a new short by Patricia Lee Stotter and Marcia Rock, is a response by women veterans to the claim that they can't serve in elite combat forces because of PMS. The comments to which the women responded were quoted in a report, "Considerations for Integrating Women into Closed Occupations in the U.S. Special Operations," written by the Rand National Defense Research Institute and included extensive interviews with Special Operations men on this topic. "Soldiers Period is a wildly hilarious short film that addresses a serious issue about women in the military. This intimate and natural biological function has not stopped women from great achievements in all walks of life and especially serving with valor and distinction in the battlefield. I absolutely adore it. Can I show it at our women veterans summit in September? "It has great spirit.... Meanwhile, tell these women -- if they don't already know - that the days at the onset of menstruation are those in which the female hormone is at its lowest ebb; thus you mighty say that women are then the most like what men are like all month long! This short evolved out of a documentary Rock/Stotter produced on women veterans transitioning from military to civilian life called, SERVICE: When Women Come Marching Home. It aired across the country on PBS stations and The World Channel, servicethefilm.com. A bipartisan group of four women senators hosted a screening on the Hill. Background: When the military opened all combat jobs to women in 2016, we asked our extensive social media network of women veterans to respond to the comments in the Rand report. 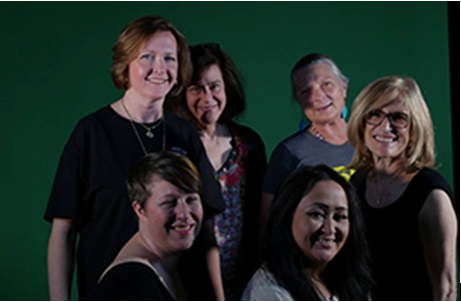 We invited four of these women veterans to represent the others and respond on camera. The short will be released on September 7 through social media. Please share with as many people as possible. We want it to go viral!!!! Who We Are: Marcia Rock and Patty Stotter started working on women veteran issues in 2009. "SERVICE: When Women Come Marching Home," aired nearly all PBS stations and World Channel. Our outreach for the film included small screenings across the country, sponsored by DAV. It was also shown on the Hill, hosted by Senator Patty Murray and other women Senators. Marcia Rock's work covers international dilemmas, women's issues as well as personal perspectives. Rock has received many awards including three local Emmys. She recently completed two films on veterans, Warriors Return about the Navajo and SERVICE: When Women Come Marching Home about women veteran's transition from active duty to civilian life. In 1997, she covered the changing role of women in Northern Ireland during the Troubles with Daughters of the Troubles: Belfast Stories (1997) that won many awards including the AWRT Grand Documentary Award. McSorley's New York, tells the story of the NY Irish through the patrons of the bar and won a NY Emmy. Dancing with My Father, takes a personal view on how adult love is shaped by what a child learns at home. Surrender Tango explores tango as a metaphor for relationships and was nominated for a NY Emmy. Rock is the director of News and Documentary at the NYU Carter Journalism Institute and she co-authored with Marlene Sanders, Waiting for Primetime: The Women of Television News. Patricia Lee Stotter has won multiple awards for her work, including two Emmy awards, an American Cine Eagle, an Apple Award, a Shining Service World Wide Award and the Silver Star Award from the Volunteers of America. Stotter has composed scores for dance, theatre, television and over 50 documentary films including Unchained Memories (HBO), Justice Denied, Is Anybody Listening?, Warriors Return, Spirit to Spirit (PBS), Discovering Women (PBS), From the Ashes (HBO), Reading from the Heart (HBO), Three Sisters (HBO) and Dramatic Need (Duaco) , and more... Patricia co-produced the multi-platform documentary, Service: When Women Come Marching Home, with Marcia Rock. The film was screened on Capitol Hill, sponsored by DAV (Disabled American Veterans) and hosted by Senator Patty Murray, as well as broadcast on PBS. Stotter also composed the scores for two other films addressing veteran issues which were screened on Capitol Hill: Justice Denied (hosted by Senator Kirsten Gillibrand) and Is Anybody Listening?, (hosted by Congressman Raul Ruiz). From children's songs to performance pieces and film, Patricia is all about the right voice at the right time.